On Saturday(January 27th) the 2018 G'Day USA Los Angeles Black Tie Gala took place at the Ray Dolby Ballroom in Hollywood, CA. To see all of the celeb looks, click HERE and continue below for the wrap-up. 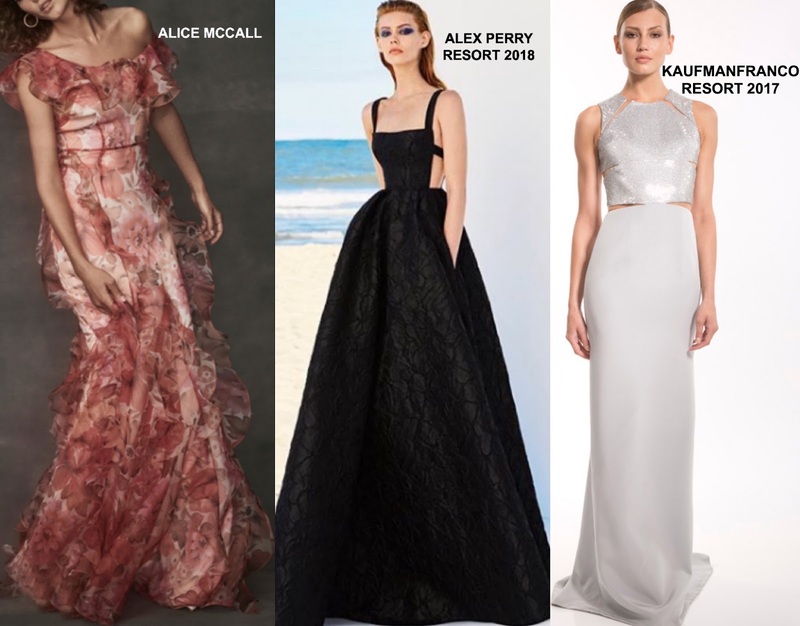 Emilie De Ravin wore a ALICE MCCALL SPRING 2018 red ruffle floral gown which was layered for coverage. A matching colored lip and a ponytail with wavy bangs finished up her great look. Lucy Fry wore a ALEX PERRY RESORT 2018 black jacquard embroidered gown with a cutout bodice and side pockets which she utilized. Accessorized with MATEO jewelry, she finished up with minimal make-up and a sleek up-do. Ruby Rose wore a KAUFMANFRANCO RESORT 2017 sleeveless silver titanium & crystal embellished gown with sheer illusion cutouts. This is a nice gown but it is too long on Ruby. EVA FEHREN jewelry finished up her look.